I'd say probably Agatha Christie. I reread her mysteries fairly regularly and while I haven't read as much of her in the past few years as I used to I've still read a number of her books in the last two years. This week's book is Once Upon a Spine by Kate Carlisle. 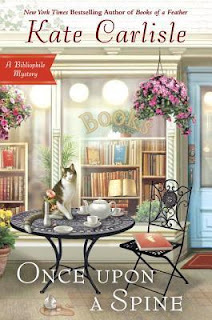 This is the newest entry in one of my very favorite cozy mystery series and one of the earliest ones I discovered. It's not the coziest of cozies and centers around bookbinder Brooklyn Wainwright. It always has mentions of gorgeous books and this book centers around a rare copy of Alice in Wonderland. Lately, I have resorted to stalking. Not a person, but a book. I can completely understand this! The fact that I'd walked in and found two unconscious people - one almost certainly dead - was something I should've been used to by now. This is a regular occurrence in cozy mysteries so I can see why she feels she should be used to it by now. This is book #11 in the series so the body count around poor Brooklyn Wainwright is pretty high! Ah Kate Carlisle. :) One of these days I'm going to try one of her books. I like the beginning, and the fact that it revolves around a rare book. Nice cover too. I don't which author I have read the most in that time frame. Most recently I have read 3 Christina Lauren books (their most recent ones) and loved them. Happy reading! Most books in the last 2 years - well, I can say that J.D. Robb is the author I've read most. I've read all her books in the last 2 years - all 40+. Otherwise, it would be various mystery series probably. Haven't read any of Kate Carlisle's books, but she's been on my list for a long time. I still haven't tried this series. I hope to get to it soon. This week I am featuring Death and a Pot of Chowder by Cornelia Kidd. Happy reading! I featured this one too! Nice cover and story. Book stalking? I'm all over it. Stalking a book... I like that! Happy weekend! Your frequent reading of Agatha Christie is an interesting choice -- or is it more of a default? She definitely wrote a huge number of books, and considering that the oldest is going on 100 years, it's amazing how they have lasted. I have been wanting to read this series. It sounds so good. Have a great weekend! Why not? I have the first on my TBR and love how it's set in my birth city! I'm sorry you have chronic tendonitis in your ankles. I've developed bursitis in my upper, left arm and that's from using weights I assume 3x a week of which I'm flakey about. My doctor had given me stronger Naproxen and I was supposed to do exercises for it but I was lazy. It gets better sometimes and then acts up again on and off. I love the sound of Once Upon a Spine. It sounds like one I would like. You know how I enjoy a good cozy mystery. Have a great weekend! I love punny titles. Hope you have fun with this one. Happy weekend! What's not to like about this one, except maybe how many installments I need to catch up on, unless they work okay as stand alone stories, but it does seem as though there is quite a strong back-story which needs not to be missed! I swear I am going to read some Christie, I am, I am...lol. I also need to read this cozy series as it's one I really want to start!! I love that beginning! So great! And the 56 has me wanting to dive into this book. The cover is super cute too. Whenever I hear Agatha Christie, I always think Murder, She Wrote. As I don't know much about either of these texts, I'm not sure why I make that connection. Alas. Happy reading! Whilst familiar with the name Agatha Christie, I don't think I've had the chance to read any of her works just yet. I have definitely heard a lot of good things about her books though, so I'll have to look into her more. Great answer! It's always nice to know that you have an author you can somewhat 'default' back to. As for the cozy mystery you've chosen this week, I'm putting it on my Goodreads shelves RIGHT AWAY. The fact that gorgeous books are constantly being mentioned in it, and there's a rare copy of "Alice in Wonderland" in the plot, too.... That's IT, I'm hooked already!! Very cool post! I love how you combined things <3 I don't think I've read a book by Agatha Christie. Too many authors to try and so little time.